If you’re a fan of Dilbert and the movie Office Space like me, chances are you’ll love the ABC America TV series Better Off Ted now out on DVD. Originally shown on the American ABC network, the show was placed in a tough spot in the TV schedule and never managed to get high ratings during it’s 2 season run although it had a core following of very keen fans. The employees of Veridian Dynamics struggle to deal with the knowledge that their company achieves its goals of creating scientific solutions to problems without any sense of ethics such as: cryogenically freezing an employee just to see what would happen, denying that it’s motion sensors don’t detect black people and trying to match employees romantically based on their genetic compatibility to create the perfect future employee. Watching “Better Off Ted” felt like a window into one of the morally ambiguous multinational companies like Bechtel or Halliburton featured in the book Confessions of An Economic Hitman I read recently. These companies have huge political influence, are often awarded contracts by the USA and international agencies to provide military contractor services, operate nuclear plants and rebuild countries after wars while inflicting these countries with massive debts. It is quite feasible that they could be working on strange projects similar to those lampooned in Better Off Ted like weaponising pumpkin! 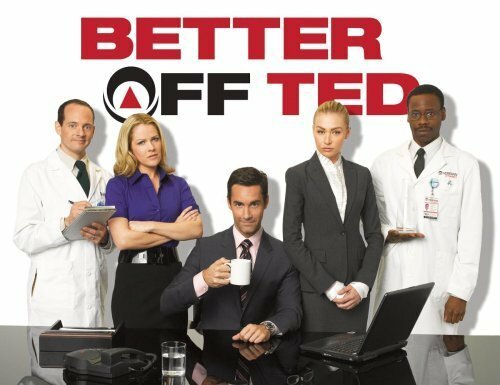 In these days of overpaid, unethical business executives and economic meltdown, there’s something cathartic about ABC’s “Better Off Ted,” a comedy with a jaundiced view of the American workplace and the very notion of “corporate responsibility.” Satirical, absurd and subversive, “Ted” is a show viewers should be able to relate to if they’ve ever toiled in an office beneath fluorescent lights and for an uncaring boss. Better Off Ted proceeds to flash-freeze Phil, one of the company’s scientists, played by the always-rattled-looking Jonathan Slavin, a Richter alumnus. teeming with sight gags — Phil freezes into a silent wail that makes him look like a frostbitten version of Edvard Munch’s The Scream — the show also excels at rapid-fire dialogue, much of it uttered by de Rossi with impeccable assurance. The single-camera sitcom is set in the moral freefall of a multinational company called Veridian Dynamics, which is choked in bureaucracy. Veridian is the kind of megacorp that does evil things, from engineering cryonics to figuring out how to use pumpkins as weaponry. One project in the premiere has employees constructing office chairs from a fabric that’s so itchy it forces workers to be productive.